An epic science fiction adventure series starring Vincent Richard Domenico. A series of four novels telling the story of Vincent’s life and his adventures as Lilea’s prophesied great warrior. Vincent Domenico, Lilea’s prophesied great warrior. His birth was prophesied many lifetimes ago by the ancient spirit people. He was destined to become their great warrior and save them from extinction by the Transmortal Army. This tide of evil known as the Transmortal Army received its own ancient prophecy. A single man bringing about their downfall and so they swept over Lilea at the destined moment of the prophesied one’s birth in an effort to outwit the ancient prophecy of their downfall. As the Transmortals swept over Lilea, killing everyone they saw, the prophesied one was born. Follow the adventures of Vincent Domenico, Farra Duncan and their friends, the legendary and secretive Drycenian Nation in this brand new science fiction series – The Lilean Chronicles. From Khrystal: – Merita King is a ingenious individual whom I am proud to have met online a few months ago. She has shown propensity toward creative, fictional writing as well as non-fiction proficiency in relaying her opinions and ideas. I highly recommend this talented writer to the bibliophiles out there! She is clever, inspired and brings to life the words scrolling in front of you. Her first novel, The Lilean Chronicles, ‘Redemption’, takes the reader on an imaginative journey and draws them into a world of fantastic scenarios and nail-biting dangers. Her hero is discovered, discarded, as a baby. How will he survive? What will he be like? Merita weaves the threads together, biding fate and chance as she leaves you salivating for more; which she delivers, again, in her second novel, The Lilean Chronicles, ‘The Sleeping’! The Sleeping continues the adventure and spell-binds the reader to the incredible plot and once again, you are gripping the edge of your seat, drooling for more! A voracious reader would do well to take note of this author and reserve, in advance, the third in this series before they are sold out! Merita King is an author ready to tackle the world… The writing-world had best stand back and make room! From Rick: – Merita, I just finished your book. I usually don’t care much for science fiction but the way you wrote the book I caught myself forgetting it was sci-fi. It had a lot of Native American beliefs and thoughts to it. I think that is why I would forget it was sci-fi. I really enjoyed the book and can’t wait for your others to come out. 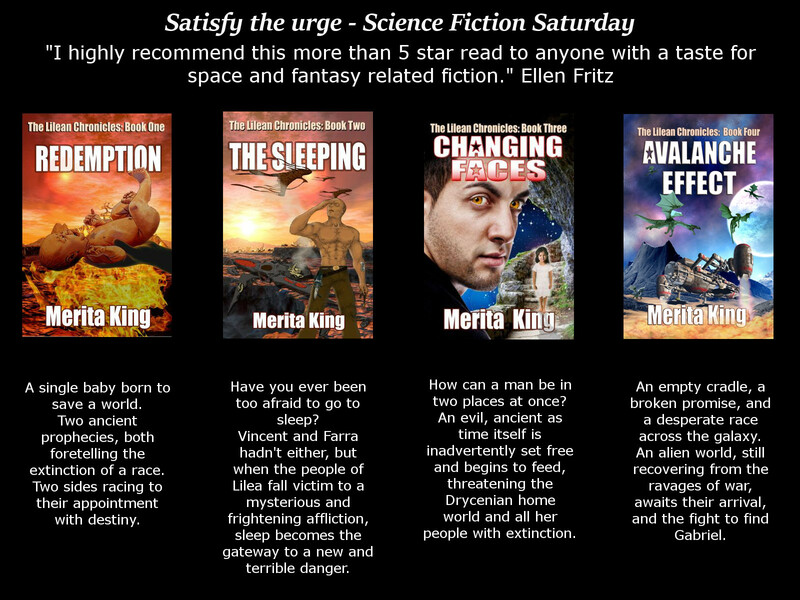 From Todd Nelsen:– Merita King’s vision is imaginative and sure to intrigue any true lover of science fiction.